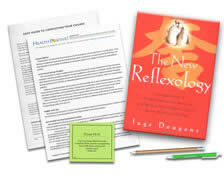 Do you have The New Reflexology textbook? See your enrollment options above for "I already own the text". This course is a multi-cultural introduction to reflexology, with a textbook by internationally known reflexologist Inge Dougans. This course identifies reflexology points and corresponding Chinese meridians on the foot. It also describes how the 12 energy meridians relate to health, massage and bodywork. This course does not teach hands-on skills. Please seek additional experience, with a mentor, to add hands-on skills. I have always been interested in TCM and this course did a great job of incorporating it with reflexology. I will definitely use this information. Info was very clear and easy to understand. The book is excellent, and I liked the review of TCM. I will definitely use the techniques provided in the book to enhance my reflexology treatments. I enjoyed the course material. The text book is well written, easy to read and refer too. I was very impressed with the service and the overall course. It was very informative. Thank you for offering this type of course. It will greatly enhance my reflexology practice. I enjoyed seeing all the connections found in one source as a massage therapist in nursing school this book will be a resource for educating patients! Good course. Glad I chose this course to further my continuing education. Clear concise and to the point. A wonderful refresher for anyone who's familiar with the practice. I loved this course, it really taught me a lot. I know a lot more about reflexology/medians of the body now. I really liked that a treatment plan was put in the last chapter and how it also showed how to place our hands to help with the strain on the therapists. I really liked how it showed where the different reflex points for the organs of the body was shown on the feet also. This is a very convenient way to accumulate CEUs. I am a more visual and hands on learner so it was a little bit more difficult for me and took me a little longer to get through the printed material and visualize it, but none the less valuable. I am so glad this is an option! Thank you! I was very interested in this subject and it will definitely enhance my practice! Thank you very much! I learned a great deal and will incorporating this material into my practice. Great course for understanding the meridians. Great class, I knew reflexology, but a good refresher and the chinese meridian info was wonderful. The course was extremely comprehensive & interesting. I wished a DVD was provided to show a demonstration of the reflexology manual sequence. That would have been so helpful! I really enjoyed this course, exceeded my expectation. I would highly recommend this course. This course was chock full of great information on reflexology. I feel that I need to go back and read the book again. Too much to absorb in one read. It was so interesting and useful. It made me want to go back and take more courses relating to Eastern accupressure studies. A little tough at times to find the correct answer to the question as I thought it could be between two answers for some of the questions. Overall, a great course. This was the best continuing education I have ever taken and I have been an LMT for 16 years and a Reflexologist for 35 years. I learned so much more than I anticipated. Inge Dougans is a wealth of info! Thank you! An excellent text for any professional reflexologist I found the course well written clear precise very interesting and and inspiring. This course has encouraged further study in the eastern modalities. So glad i enrolled in the course because I learned so much about TCM. I will definitely reread the text. This course was extremely well done and informative. I would have liked a full-foot reference chart. I will recommend this course to my co-workers! Thank you! I have been looking for a Reflexology course because I had an interest in it when I was in school. This course was very interesting. I enjoyed reading the book and it will be a good reference tool. Thank you! This course was extremely interesting to me. I have practiced Reflexology for 14 years and the information in this course has broadened my knowledge about meridians. I really enjoyed the course!!! It is very interesting and illuminating. The author explained the material very clearly and in an organized structure. Thank you. Loved this system of reflexology, as I had loved the authors first book. It puts it all in a perspective that makes sense since I knew a bit of the systems she teaches. So looking forward to practicing this! I really loved this course! It sparked my interest in TCM! I have studied it here and there through the years, but it seems now that this may be my next course of study for the direction of my business. I am interested in an online course specifically in TCM and acupressure therapy. This is an excellent course that will help both personally and professionally. Highly recommended. Excellent book and course. My training for LMT was done with a huge focus on TCM, dx and tx. This was an excellent presentation and right to the point. If you had a lot of training in TCM, OCA (Oriental Clinical Assessment) and AMMA, this course would be very interesting if schooling focused more on Euro-massage. This may spark an interest in TCM. Love it!! This is my third course with the Institute ... They are helpful and easy to follow ... Thanks ! Identify how Europe and America influenced the development of reflexology; the Chinese connection, and the ways that zones and meridians relate to each other. Define and differentiate between energy and Chi. Define and differentiate the yin/yang, 5 elements and meridian theories. Clearly communicate why the meridians are essential for reflexology. Identify at least 5 correct applications of meridian theory and the 5 elements in reflexology practice. Identify how the muscles, each of the 5 elements, and the 12 meridians relate to health and to massage and bodywork practice. Correctly relate each specific area of the foot to the corresponding reflexive area of the body. Correctly relate structural foot problems to imbalances in the rest of the body. Identify the responsibilities of a reflexologist, common client reactions and how to determine the appropriate length of treatment. Identify the correct way to perform the basic treatment techniques and the recommended sequence for a reflexology treatment. What are the two functions of the Fire element that are important to the overall harmony of the body?